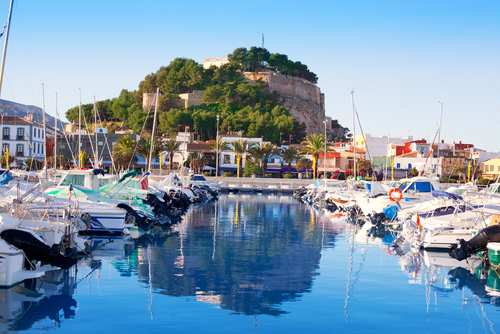 The Costa Blanca has long been a popular choice with those looking to buy a property in Spain. Much has been made of its environmentally perfect climate – one of the best in the world, according to the World Health Organisation. Make the most of 320 days of sunshine a year, whatever you most enjoy doing: watching the world go by from a pavement cafe, a leisurely round of golf, lazing on a beach, or something a little more active. It really is possible to enjoy a year round outdoor lifestyle here. Running down from Gandia, with Alicante generally recognised as the dividing line between Costa Blanca North and South, the northern end of the Costa Blanca has been less affected by large scale tourism than the South. Moraira, Denia and Javea are in a conservation zone, where building heights and density are strictly controlled. The Costa Blanca (White Coast) can be divided into two parts, Costa Blanca north and Costa Blanca south. The northern half includes the popular coastal towns of Denia, Javea and the Jalon and Orba Valley areas, while the South includes towns such as Torrevieja and Quesada, and the well-known urbanisations of the Orihuela Costa, such as Villamartin, La Zenia, Los Dolses and Playa Flamenca. On our website you will find hundreds of properties in the Northern Costa Blanca region such as Denia, Javea, Benidoleig, Orba, Jalon and the surrounding areas. Our property lists are frequently updated and our professional and informed staff can help you understand the local market and make an informed decision when buying any type of property. A cosy detached villa only 400m from the beach. A detached villas with private pool to be built on a plot with sea views in the Santa Lucia area. Brand new apartments to be contructed within walking distance of the popular Arenal beach of Javea. Semi-detached villas with stunning sea views in the popular Altea Hills close to Mascarat in Altea. Newly reformed grand townhouse, in the heart of Pego town. Reduced by €15,000 - A 5 bedroom, 3 bathroom Detached Villa with views over the Orba Valley. Brand new modern ground floor Apartments second line from the sandy beaches of Denia. Brand new apartments in the popular area of Polop close to La Nucia and all the amenities. Pretty, corner, linked villa in a quiet location of El Vergel, close to the beach. First floor apartment in an excellent location, within walking distance to the town centre. Grand townhouse in Alcalali, with a private garden to enjoy and soak up the North Costa Blanca sun. Reduced by €90,000- A Stunning villa, panoramic views. Completely renovated. Communal swimming pool, close to shops and restaurants. A very spacious townhouse at an excellent price.